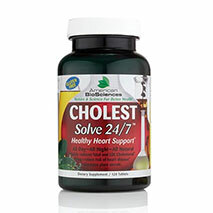 If you’ve been indulging a little too much over the holidays and are looking to get back on track, support healthy cholesterol levels with CHOLESTSolve 24/7. This formula carries a beautiful formulation of supportive nutrients including plant sterols, green tea leaf extract, and quercetin. Quercetin has so many health benefits, it’s hard to believe that it’s not used by everyone concerned about good health. Kale, blueberries, and green tea all top the lists among the many considered “superfoods,” but what makes a superfood super? 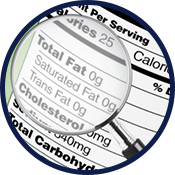 The common active compound in all of these foods is quercetin. 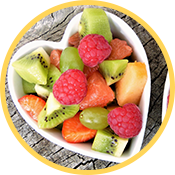 If you seek heart health; quercetin is the nutrient for you! 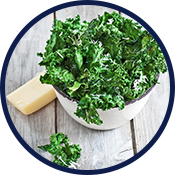 Quercetin is considered a flavonoid antioxidant that is plant-based, and is found in foods such as dark leafy greens, berries, broccoli, and tomatoes. When you consume brightly pigmented fruits and vegetables, you’ll most likely get some quercetin in them, as it is one of the most widely found antioxidants in the human diet. First and foremost, quercetin is an antioxidant, which means it fights and protects the body from free radical damage and oxidative stress. But, what do these concepts really mean? Antioxidants – These compounds support the body by protecting it from free radical damage, which can affect aging and disrupt inflammation balance in the body. Balance is key when dealing with antioxidants and free radicals. When the antioxidant balance is greater than the free radical balance, as a result of healthy eating, this allows the body to function optimally and support your overall immune system. On the contrary, if you have poor nutrition and the balance is tipped towards free radicals, you may experience decreased immune function and increased signs of aging. The lifestyle choices you create, such as eating a diet rich in antioxidants, will only benefit the balance of them in the body. 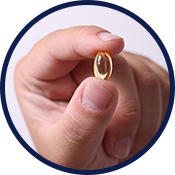 Free radicals – Free radicals are uncharged molecules that damage the cells in your body. Having free radicals within your body is not uncommon or abnormal, but having them in excess can be harmful. Free radicals are helpful in supporting other biological reactions such as liver detoxification, breathing, and even fighting bacteria! However, because they’re so unstable, they’re constantly looking for any compound to interact with. Since free radicals are missing an electron, they have the ability to react with anything they come into contact with, including healthy cells and tissues. They’ll rob other cells and compounds of their electrons and produce a chain reaction that quickly results in an overabundance of them; this is how antioxidants help our system. Combat oxidative stress with the antioxidant quercetin. Because quercetin is highly abundant, it aids in immune support and inflammation balance in the body beautifully, which is why it’s a power player in cholesterol balance as well. Quercetin is also beneficial for maintaining healthy levels of cholesterol in the body because inflammation is the root of most diseases, like high cholesterol. The antioxidants in quercetin are also extremely protective and balancing for LDL cholesterol levels, in addition to supporting healthy blood pressure levels as well. 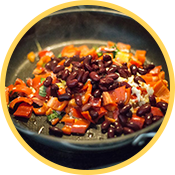 Quercetin functions as an antioxidant and blocks the oxidation of LDL cholesterol, and helps counteract and balance the inflammation that precedes atherosclerosis. Quercetin—a power player in the world of superfoods—is a plant-based antioxidant that works to balance and protect your body from many things, including high cholesterol. While eating foods rich in quercetin is extremely important, if you are prone to high cholesterol, you may want to take advantage of this antioxidant in supplement form for increased support. Support inflammation balance in the body — as an influx of free radicals disrupts this balance and cause harm — and support healthy LDL levels with quercetin. If you’re looking for cholesterol support this formula is a power player, and it contains quercetin for beneficial support.